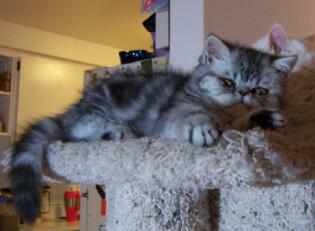 Hair Length is one of the biggest challenges for Exotic breeders...the quest to get short hair on all of our kittens! 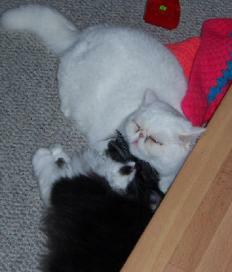 The Exotic is a short haired Persian. 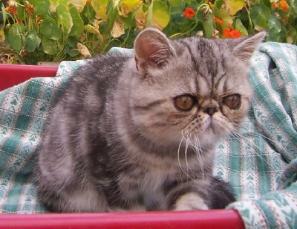 Many Exotic breeders use Persians in their breeding programs. There is no magic formula...it's whatever works for your individual program. ...you have to build the house before you can paint it. 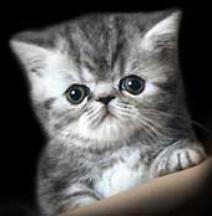 What is important is the overall quality of the cat you are using. How does it compare to the breed standard? How do the cats you are using compliment each other? Just as, there's more to a Persian than a short nose, there's more to an Exotic than its coat length. There's a total cat package in an Exotic and you have to breed towards the total Exotic standard (which, in CFA, reads identically to the Persian standard,except for coat length). Whether you use only shorthaired Exotics (ESH), or you mix the shorties with Persians and/or longhaired Exotics (ELH), is a personal choice. What is important is the overall quality of the Exotics you are producing and that you understand your genetics. Know how to read a pedigree. In CFA, we have registration number prefixes that tell us if a long hair Persian is a "pure" Persian (only Persian lineage) or a long hair from Exotic lineage. 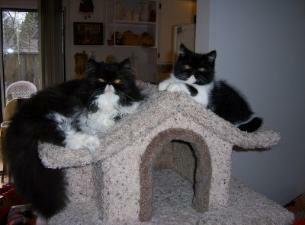 "Pure" Persians and long hair Exotics LOOK identical! As far as the genetics of their coat length, they will breed EXACTLY the same. The gene for short hair length is dominant, L.
The gene for long hair length is recessive, l.
A homozygous shorthair is noted LL. This cat has two dominant genes. it only has shorthair genes to give. A heterozygous shorthair is noted Ll. 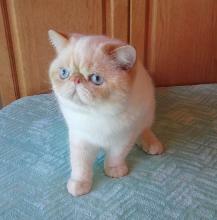 This cat has a dominant gene and a recessive gene. and a longhair gene from the other parent. A homozygous longhair is noted ll. This cat has two recessive genes. Can we find out what Fluffy's hair length genetics are? Let's start with her father's side of the pedigree, Cinderfella, ESH. Since he's out of 2 Exotics, we need to look at his parents. His father, Hot Dang! is an ESH out of a Persian (ll) and an ESH. matter, since she gave a short hair gene to her son. Let's say she's htz (Ll). Now let's look at Cinderfella's mother, Fire N Ashes, an ESH. Her father, Burnt Offering, is an ELH (ll). Her mother, Flash Dance, is an ESH, let's say she's hmz (LL). lets see what Cinderfella could be. 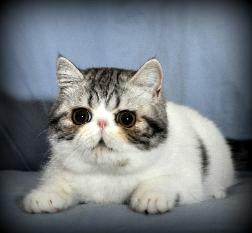 Painted Lady is an ESH out of a Persian (ll) and an ESH. We automatically know Painted Lady's hair length genes are Ll. The l comes from her Persian father and the L comes from her Exotic mother. Midnight Kiss is also Ll since she is out of a Persian (ll) and an ESH. Dang! 's hair length is Ll. Ashes' hair length is Ll. hmz (LL) or htz (Ll) ESH.